Welcome to Pine Chiropractic Center! "COMBINING TRADITION WITH TECHNOLOGY SINCE 1978"
Located in the heart of Pompano Beach, the leading health professionals at Pine Chiropractic Center are dedicated to helping you achieve your wellness objectives -- combining skill and expertise that spans the entire chiropractic wellness spectrum. Drs. David and Ross Pine are committed to bringing you better health and a better way of life by teaching and practicing the true principles of chiropractic wellness care. Patients seeking treatment at Pine Chiropractic Center with Drs. David and Ross Pine are assured of receiving only the finest quality care through the use of modern chiropractic equipment and technology. Drs. David and Ross Pine and the staff have a genuine concern for your well-being! If you are new to our website, please feel free to discover and learn about chiropractic wellness. If you are interested in starting your journey towards wellness please subscribe to our award winning newsletter. If you are already a newsletter subscriber, please explore the member wellness section of our website for wellness articles, resources, and health facts---specifically targeted by Drs. David and Ross Pine to your wellness needs and interests. We provide advanced spinal correction utilizing traditional manual manipulation as well as state of the art computerized technology with the ProAdjuster. Never in the history of Chiropractic have we been able to provide the high level of diagnosis, treatment and expertise that now exists. These newer correction methods are even safer, more comfortable and more effective than ever before. As Doctors of Chiropractic, Drs. 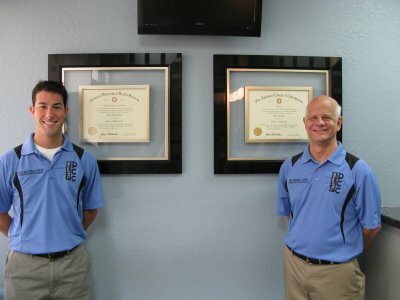 David and Ross Pine have years of training and experience in spinal adjustment. The office is equipped with the ProAdjuster system for painless and safe spinal manipulation. ~~For more information or to schedule an appointment with our Pompano Beach chiropractors, call 954-782-7006 today! Drs. 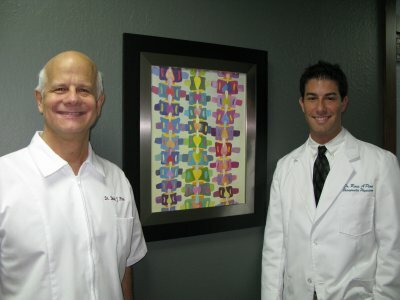 David and Ross Pine are chiropractors serving Pompano Beach and the surrounding area. Our chiropractors and the rest of the welcoming team at Pine Chiropractic Center are committed to providing chiropractic solutions to address your unique needs, whether you are experiencing back pain, neck pain, headaches, or even muscular tightness and tension. You may be searching for pain relief after an accident, experiencing an injury, or if you suffer from a specific condition like chronic back pain or a spinal condition. Even if you're looking to improve your overall health, our chiropractors can help you attain your everyday wellness goals! Visit our testimonials page to find out what our patients are saying about our Pompano Beach chiropractors and our chiropractic care plans. At your first visit to Pine Chiropractic Center, Drs. David and Ross Pine will explain how chiropractic care works and give you a full evaluation to see if our chiropractic solutions are a good fit to address your needs. If there is a good fit, we can customize a plan of chiropractic care for your condition and health goals. If you have not been to a chiropractor before and want to find out more, please email us or call 954-782-7006 to receive the answers to your questions from our experienced team. We also welcome referrals, so we invite you to use the "Send to a Friend" link to share our chiropractic and wellness information with your friends and loved ones. We address the serious nature of auto accident injuries Click to read more! "Most modern, effective, accommodating chiropractor that has ever treated me. 2 weeks after a damaging car accident and a few treatments I am definitely improving. My back, neck, and ribs are almost painless."